Bob on Sesame Street taught us to know the people in our neighborhood. But Sheldon in The Big Bang Theory taught us to know the stars in our neighborhood, too. Our stellar neighborhood is a bit larger than your own neighborhood. As we discussed before, the nearest star to our own solar system is Proxima Centauri. Suppose you lived in a typical suburban house with a 50 foot driveway. If your driveway were like the distance from the Earth to the Sun, then Proxima Centauri would be about 2500 miles away. Even survivalists can’t get this far from their neighbors. When the writers asked me to find the names of the stars, in order of proximity to us, I figured that would be easy. But it was a case where the internet fails. Nearly all the lists on the web are in disagreement with each other. And the writers needed an answer…fast. These are the stars in your neighborhood. In your neighborhood. In your neighborhood. So we heard the list from Sheldon. Special thanks to none other than “The Bad Astronomer” for helping out with the pronunciation of the star names. What about those crazy names? These stars were discovered over thousands of years. Some are visible to the naked eye. “Sirius”, the brightest of the stars, was named by the Ancient Greeks after their word for scorcher. Others are named for the constellation they are in. “Alpha Centari A” is the brightest of the stars making up the constellation Centaurus. “Epsilon Eridani”, named after the constellation Eridanus and the fifth greek letter, is the fifth brightest star in that constellation. But closest need not mean the brightest. 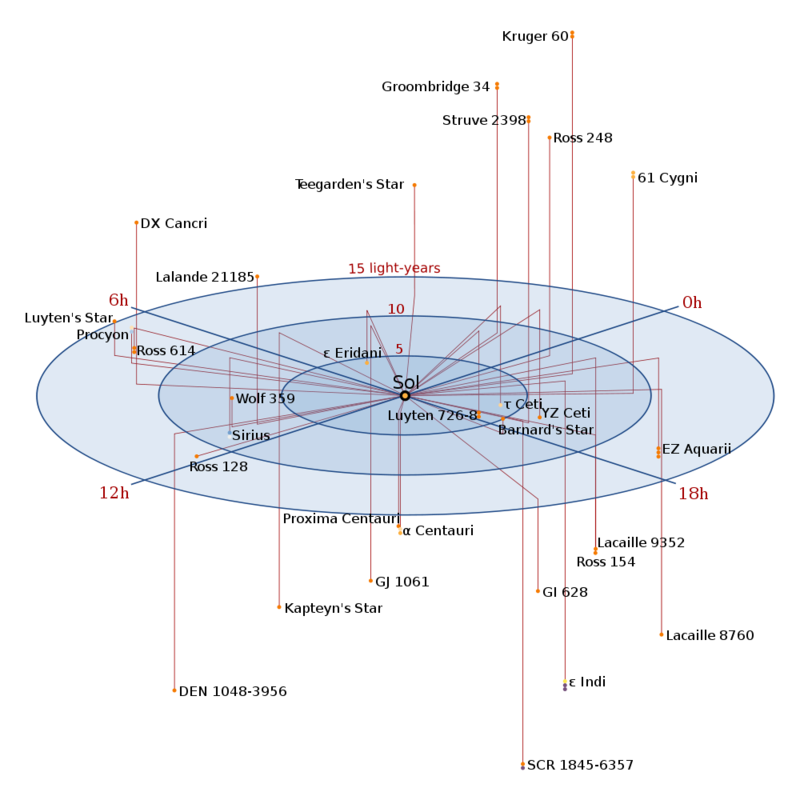 Many of these nearby stars were not discovered until modern times and are named after their discoverers: Jérôme Lalande discovered “Lalande 21185” in 1801 and “Ross 154” was only found in 1925. Some of the stars are close together: Proxima Centauri and Alpha Centauri are a pair, forming a binary star system. So are Sirius A and B. About half the stars closest to us are pair-bonded. Our star appears to be alone. Or is it? Some people have proposed we have a distant and dim partner, called Nemesis. So-named because when its orbit brings it back close to Earth, its gravity would disrupt the comets and asteroids causing them to rain down on us. It has been proposed to explain a possible periodicity, about 27 million years, of mass extinctions found by paleontologists. The periodicity of these extinctions is not universally accepted. And the explanation of periodic extinctions being induced by a companion star even less so. Nevertheless, I named the first electronics board I build as a graduate student “Nemesis”. If there is such a “Nemesis” star orbiting our own, a new survey will find it. The WISE satellite, the Wide-Field Infrared Survey Explorer (led by my same friend at UCLA) is looking. Infrared light is redder than the reddest light you can see. Really hot objects, thousands of degrees, glow in the visible light such as a lightbulb filament or the Sun. The reason you can see your friends’ faces it that visible light reflects off of their faces to your eyes. But if you had infrared eyes, your friends, cooler than the Sun but still hot, would glow but in the infrared. (Compared to absolute zero, all your friends are “hot”. Compared to the Sun, they are “cool”. Feel free to compliment them on this.) So infrared is the go-to color for astronomers to find small, cool, faint stars, that might have been missed by all astronomers until now. 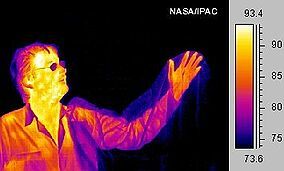 The human body glows with the infrared light due to the heat it generates. Astronomers look for dim, cool stars with infrared telescopes. Update: Since the time this espisode aired, the measurements of the distances to the Procyon stellar system and 61 Cygni system have changed slightly, so their order according to RECONS is now different than the order in the song. Thanks to eagle-eared viewer Åingeal S. for asking me why they were “wrong” which allowed me to locate the difference using the internet archive of the RECONS webpage. This entry was posted on October 21, 2010 at 5:20 pm and is filed under Uncategorized. You can follow any responses to this entry through the RSS 2.0 feed. Both comments and pings are currently closed. I did notice that Sheldon left out the sun in his list of stars and did notice that he was listing them in distance order. WISE is an interesting satellite and a good follow-up to WIRE which was a failure. The Federation is most certainly very close to the Sol system. In “Star Trek V: Never Let Shatner Direct” a Klingon ship destroys either Pioneer 10 or 11. By the 23rd century those spacecraft will still be well within a fraction of a light year of the Earth, implying Klingon patrols come *rather* close to the Sol system! I am honored to be a part of geek history. Thanx for the input. I’ve read a lot about this nemesis. Some people think it might be a brown dwarf that is still invisible in many sprectra to us. In other terms, people have come up witht the dark matter theory saying that if there’s matter, even if it absorbs light it should re-emit it. But if we can’t even see a close brown dwarf, how could we see billions of them at a thousand light year distance ? Such objects are called MACHOS: Massive Compact Halo Objects. Not just brown dwarfs fit into this class but also jupiters and such. People look for these by their effects on gravitational lensing of stars etc. There does not appear to be enough of them. Also, other measurements say the dark matter is not made of normal matter (protons neutrons etc.) but is a new kind of particle. One good candidate is the opposite of a macho, called a WIMP: a Weakly interacting Massive Particle. I cannot read this blog without hearing Sheldon’s voice. This annoys me. I am sad and upset, I missed BBT for the first time in a while and missed Sheldon’s little ditty poem on the nearest stars. Is there any way I can get the video of the episode or can you publish the poem for us to enjoy? I’d really love to be able to quote this for my students when I start teaching astronomy in a couple months! Thanks for whatever you can do. Glad RECONS could assist BBT in some way. Great to see our stellar neighbors getting some screen time!